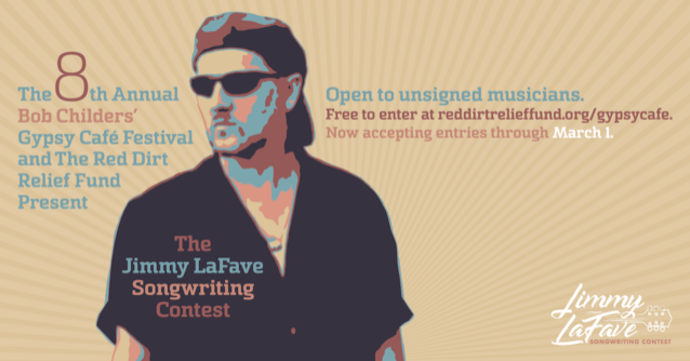 (STILLWATER, Oklahoma / April 4, 2019) - “Abilities” by Dallas Parker, “Angels Lullaby” by Ashliann Rivera, “Breathless” by Chloe-Beth Campbell and “Hollyhocks and Morning Glories” by Scott Aycock were selected from 74 entries as finalists in the second annual Jimmy LaFave Songwriting Contest. Finalists will play their songs before a live audience at the Gypsy Café Pre-party hosted by the Red Dirt Rangers on April 30th from 6:30-9:30pm at Iron Monk Brewing at 519 S. Husband, Stillwater. At stake for the finalists is the chance to secure a spot in the lineup at Bob Childers’ Gypsy Café on May 1, a $500 cash prize plus a $500 donation made in the winner’s name to the Red Dirt Relief Fund. A $100 “People’s Choice” prize will also be awarded by a vote of those in attendance. This event is free and open to the public.